This month – March – marks our 4 year anniversary in Thailand – wow, where has the time gone? I still like to publish bi-monthly posts to share a bit about our retirement living in Chiang Mai. The idea being that family, friends and anyone contemplating or in retirement here can see what life is like for one expat (me) and his Thai partner (Ace). In this post I comment on the new year ahead, our garden & changing weather, pets & sadness of loss, living in Thailand – insights on the smoke season, driving & health care; and then our social times, outings and food places. Who knows what’s in store for the year so let see how we fare on these. The new year started out over the months of January and February as very busy in the part-time consular role, limiting our somewhat tranquil retirement. You can see what we have been up on the separate “Consulate Blog“. This has meant fewer personal activities but all very enjoyable in our part of the world. The following is a snap shot of what has been going on with our simple life around our very ancient city. Having pets is a wonderful addition to life except when they get sick and you lose one. The past two months have seen our beloved little cat Lindsay diagnosed with kidney failure. Many trips were made to the vet in an effort to try to help her. It was hard to watch her waste away and lose her battle with life. She was taken to the local veterinary college for cremation and returned to rest in her garden at home. Lex our dog and Lucas the cat (Lindsay’s brother) continue to make life enjoyable. Lucas seems to be missing his sister after all these 12.5 years. He is often in the garden making lots of vocal noise. Life goes on and our daily walks along the country lane continue with found memories of my companion cat. Smoke Season – As we head into summer the downside to this time of year is the air quality in the North of Thailand – it is very poor – here is monitoring website. While there is a burning ban in place the agricultural practise to burn the harvested fields and forest floors has been going on for centuries and hard to eradicate. The big companies with their large corn (maze) fields and neighbouring countries with similar practises are big culprits to this problem & health hazard. There is much written on the topic, the Government is aware of the problem and are attempting to tackle solutions. See the pictures & comparison between seasons. While it is currently really bad the past year was better and it last for anywhere from a month to six weeks. Living away from the city we don’t seem to be as impacted as some. Some people leave the area during this period while others stick it out. It is a shame this problem spoils the normally very enjoyable north of Thailand. Here a link to a recent article from Chiangmai Citylife. Driving safely – Firstly there is perception that “Thai roads are dangerous and some drivers are reckless behind the wheel”. Statistics of vehicle accidents and deaths on the road portray a very scary perspective as highlighted in the Bangkok Post article. With streets littered with tuk-tuks, taxis, cars, trucks, transports and motorcycles, and some with a seeming disregard for speed or safety, the roads can at times seem pretty daunting! I do find myself getting frustrated at times, with what I perceive as poor driving skills, but I have found that using defensive driving techniques learned years ago and understanding and accepting Thai driving styles has made road journey’s safer and easier for me. Expecting the unexpected and being aware that other drivers might not adhere to road rules allows for greater awareness of what is happening around you. I tend to drive slower, anticipate others likely moves behind the wheel. I see that drivers of all vehicle types might not necessarily stop for lights at intersections, in fact they may continue through red lights for 3 or 4 cars; they may change lanes without signalling or pull out from the curb with no warning. Lane marking are a guide it seems or for some a line to drive down the centre of. Speed limits are again a guide and vehicles seem to travel at their own discretionary speed – some very slow and some extremely fast and judging your next move can be a challenge. Motorcycles in particular use any space on the road, will drive on the left and right of you or on the wrong side of the road towards you at times. At intersections they like to move to the front of the queue in a bunch and it is best to let them go when the light changes to avoid an interaction. If you are turning left, watch out as a motorcycle may well be trying to pass your vehicle on the left turn, while you are watching to the right . Like many things in Thailand road safety – is up to you! Thai people believe in fate and if an accident is meant to happen it will. There doesn’t seem to me to be a strong view for some people who driver safety and care on the road can avoid these mishaps. Here is a blog that I think helps sum up what you might expect driving in Thailand. Health matters – Kidney stones, are painful – trust me. We have some great medical facilities and doctors in Chiang Mai so looking after your health is not a problem here. Wether it is a hospital or private clinic you can get good care. Facilities such as Bangkok Hospital, RAM Hospital, Suan Dok/Sripat Hospital or the new Geriatric Medical Centre (strange name) on Hangdong Road. I often use this new Geriatric centre (not because of my age) but for any simple clinical needs as it is handy and less congested. They seem efficient and the doctors & nurses I have come in contact with all spoke English. While Ace seems to be in good health and not needing to visit the doctor, he often complains of aches and pains – maybe his age or his house work? For me over the last 4 months I have been visiting a Urologist and trying to blast away a troublesome and at times painful Kidney stone. Monthly I attend Suan Dok Hospital to undergo shock wave treatment – it is working and the stone is moving closer to the elimination point. It’s very hard stone apparently and will not shatter – if it’s not out soon thankfully it is low enough for an operation to remove it…. I continue to monitor another health issue that hasn’t gone away. It is nice to be connected to our community here in Northern Thailand and with it the opportunity to enjoy various outings and activities with new friends and associates. One of the experiences we always enjoy is trying out Thai food – it is also a plentiful resource and available everywhere. A coffee culture with cake shops abound for tempting treats that we often enjoy on our outings. I do try to capture a few pics when we go out so I can share – sort of hobby. 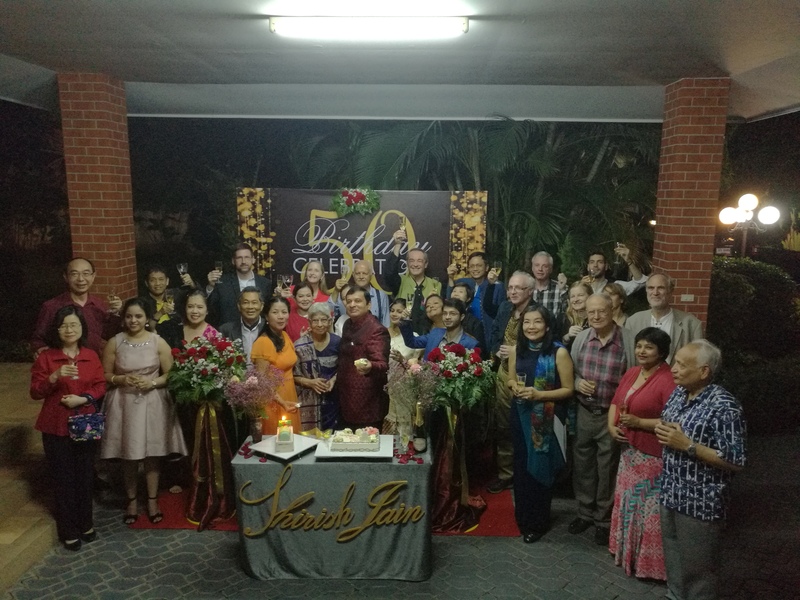 Birthdays & Gatherings – First off this year we attended a birthday party for the Indian Consul here in Chiang Mai – his big 50th celebration arranged by his wife at their residence. A big feast and good company made for a fun night. A few invitations to friends houses for dinner were accepted over these months. It is nice to know people and to socialise in these dinner party settings where we have a few laughs and cover many topics. Expat Club – I am still going along, on occasion, to club general meetings and to their twice a month morning breakfasts – not so regular with work but try to keep in touch with the group. 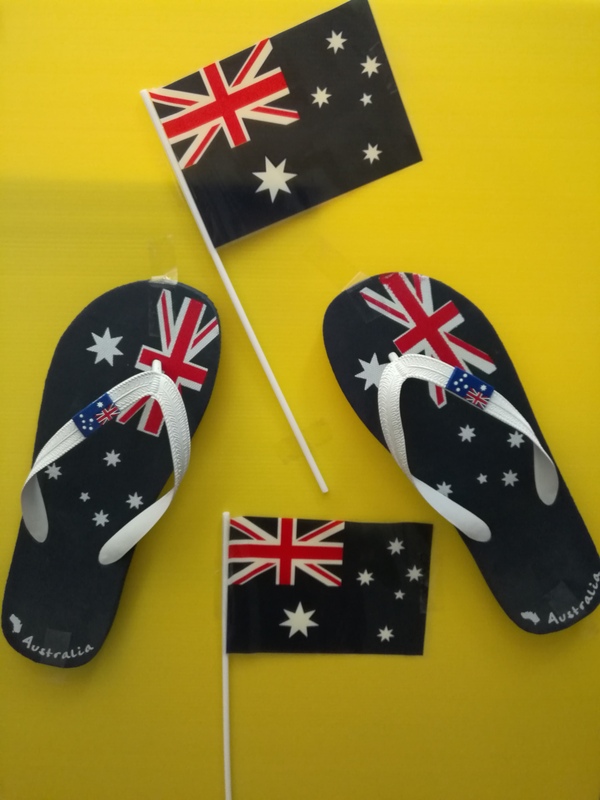 Australia Day – got to really participate locally through some consular activity – had a fun day chatting to many people & eating. Big eat up at Yummy Pizza at night while being entertained by a singer from Aus – see the “consular blog” about our Australia Day in Chiang Mai. Im Cafe & Perfect Spa – for the car. There seems to be a growth in vehicle spas – or car washes around Chiang Mai. I like taking the truck to the spa as they do a good job and stopping at Im Cafe to have cool drinks and cakes on Ratchapruek (garden) Road. The guy that runs it is Thai Australian having lived in the Pilbara for many years. Royal Garden Restaurant – an old favourite we visit a few times a month. It is just outside the Royal Garden Ratchapruek Park on the road to Doi Khum temple and across from the Royal Project retail shop. Thai gum trees along the road too. It has a great menu and nice atmosphere – an enjoyable spot for lunch or coffee and snacks. Royal Rose Garden Restaurant – been here before but it is always nice to visit again to this tucked away spot on the Samoeng Road. This time is was with a small group of friends. Good food, mainly Thai and a growing rose garden to explore. Lovely spot, good food and colourful atmosphere. Puffin Doi, Hangdong – Spent a relaxed, tranquil in Thailand, time in a rural part of Chiang Mai up a narrow road in the hills not far from our house. Nice cool breeze, great outlook and a shared mango with ice cream. Nothing else required at Phufinn Doi. These are the types of neat places I like to find. Chiang Mai Flower Festival – after 4 years this was our first time attending the festival and parade. While it was related to work it was still enjoyable and there was lots of colour to see and enjoy – pictures do it more justice I think. See the “Consulate blog” for more details and pics. Krisdadoi/Flora Creek – Afternoon coffee was in order on the way home after lunch – so keeping the garden theme going after lunch at the Rose Garden – we stopped here on Hangdong – Samoeng Road. The place covers over 10 acres of expansive landscape against the backdrop of lush forest, colourful flower garden and perennial stream from the national park. Khualek Cafe & Restaurant – it has become one of our favourite places when in the city – it seems relaxed on the river with views to the city. Food menu is extensive, not expensive and always good – but I’m not hard to please. This was an evening visit with different night-time views of the river and city. It also looks empty but it wasn’t. Huen Jai Yong Restaurant, San Kamphaeng – Another relaxed outing today for lunch with friends at this unique old wooden Thai venue outside Chiangmai. Great inexpensive food and a feast for 4 for about 300 THB (just over $10). Really busy and popular with locals. Fund Raiser – (FERC) – Foundation for the Education of Rural Children fundraiser at the River Market Restaurant on the Ping River was the venue for afternoon high tea with some friends. Great cause to provide scholarships to needy children for them to complete their secondary education. Chiangmai Land Road – really nice Issan food place (on cm land alley 7) – signs in Thai and Thai menu but really yummy food & very clean. Often go here for lunch when doing business in the city – all this food for $10. 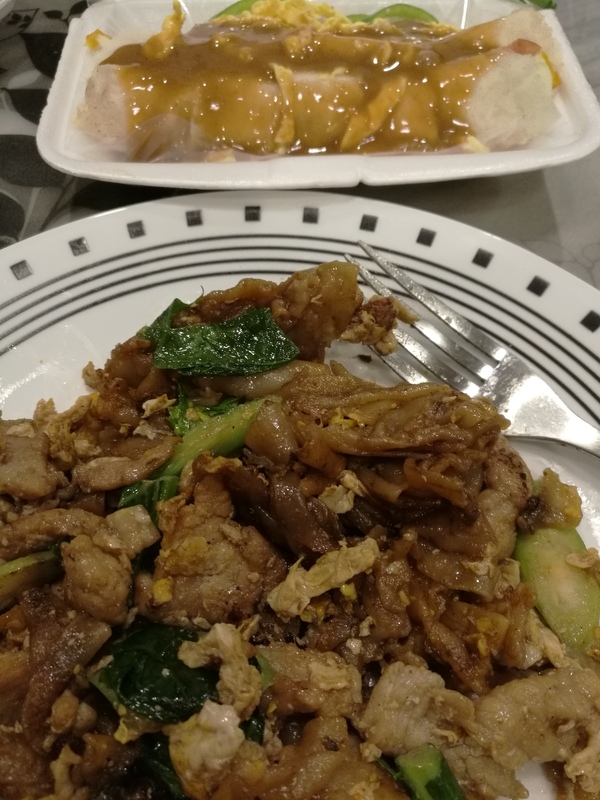 Thai Food – Market Dinners/Take aways – many a night we just prefer to stay home. Having been out on business or doing chores, often having lunch somewhere, we often head to one of our local market to get dinner. Ot could be for for a great Pad Thai. Other times we browse around often getting a good somtum (papaya salad) and “gaeng hang lay” curry. Kaeng hang le originates from Myanmar. The origins perhaps are closer to the northern Thai border in Myanmar, where a pork curry Thai version includes tamarind. Hang le is derived from the Burmese words hin lay. Or it might be some fried noodles and vegetable wraps with tamarin sauce (see the picture). Other options are the Vietnamese salads and pancakes. All yummy, inexpensive and easy. One Thai dish I have come to enjoy is “Fried Rice with Shrimp Paste”. 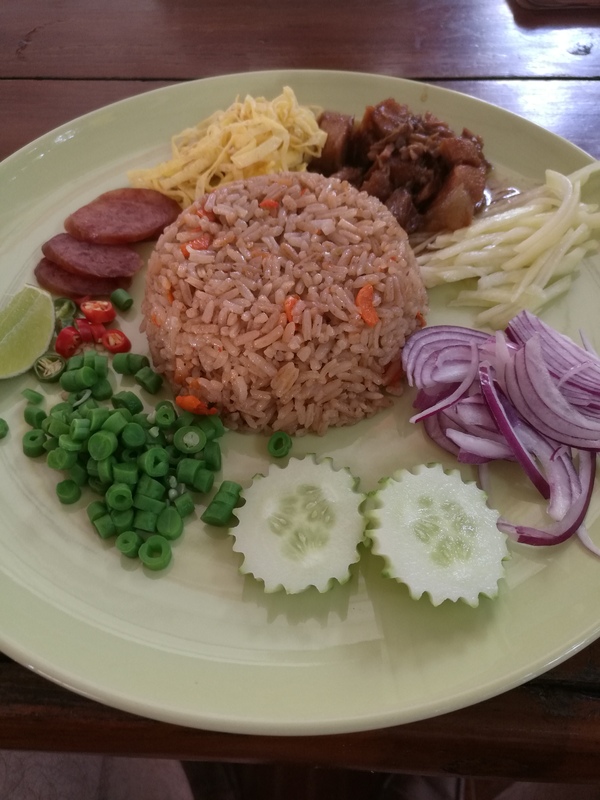 It is very definitely a Traditional Thai Fried Rice Recipe and at the same time very different from most others. Khao Klook Kapi (aka Khao kluk Kapi) is something of an acquired taste, so when trying this recipe for the first time go easy on the shrimp paste. Because this traditional Thai fried rice recipe is laced with shrimp paste it gets surrounded by a lovely range of nibbles including sweet pork or chicken, fresh shallots, chillies, green mango and cucumber, flash fried dried shrimps and a special shredded omelette. So there you have it – the past couple of months of – living tranquil in Thailand. Look forward to another post about the months of March and April – until then; enjoy life.